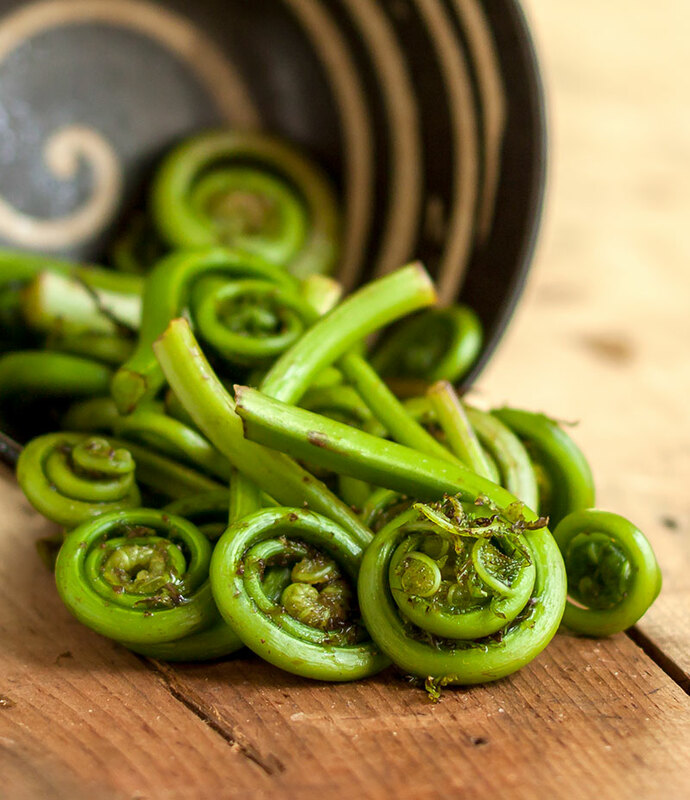 The fresh flavor of fiddleheads, that wild spring vegetable with the charming name, is distinctive, but not assertive. It’s these qualities that make fiddleheads so versatile. They can be prepared in any number of traditional ways, but they also make a fine substitute for just about any green vegetable. Think of any dish that calls for green beans, asparagus or even broccoli and use fiddleheads instead! But before you add fresh fiddleheads to your favorite recipe, they need a little basic prep. First, give them a good rinse in cold water to remove any residual brown chaff, next, a quick trim to remove the brown end of the cut stem (harmless, but unsightly) and last, a brief plunge into a pot of boiling water. Your fiddleheads are now ready to use. 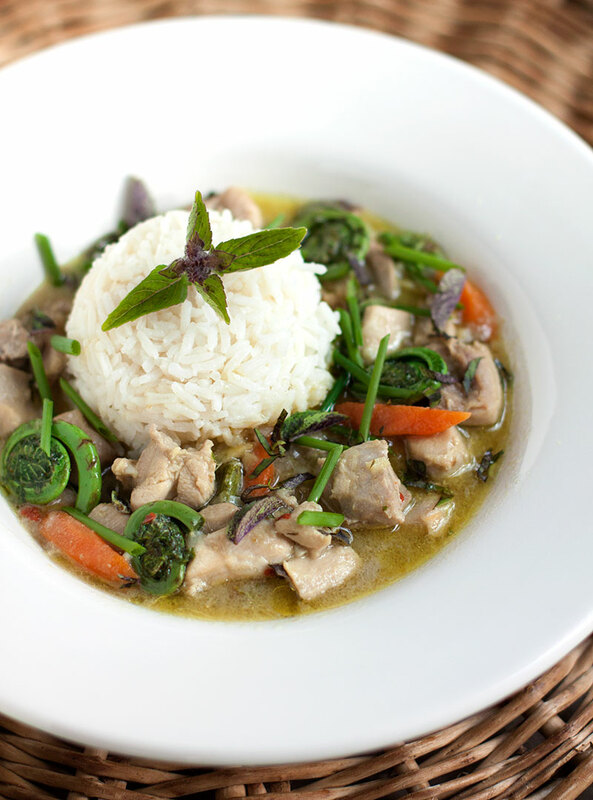 The fiddlehead’s wild “green” flavor goes very nicely in this version of a classic Thai dish, green curry. Thai curries have their roots in Indian cuisine, but, over time, were transformed and adapted by Thai cooks into a new and quite distinctly different form of curry. There are as many different Thai curries as there are colors of the rainbow, but green curry is unique in its use of fragrant green herbs that give it both distinctive flavor and color. Like other Asian cuisines, Thai cooking combines the basic components of flavor – sweet, sour, savory, bitter and salty – together in a single dish. Many Thai dishes, like this green curry, depend on some standard ingredients to achieve this balance. Fish sauce, fresh squeezed lime juice, sugar and salt are among the most essential building blocks for authentic-tasting Thai dishes. Keep these ingredients on hand and you’ll be assured of success! 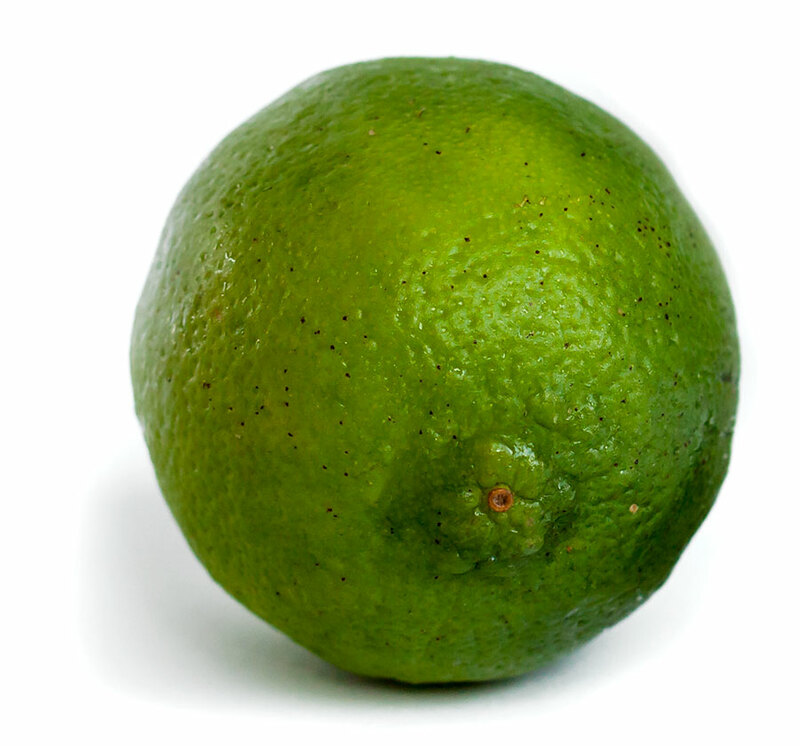 While you can make your own, to keep things simple, we used a store-bought green curry paste. Keep a jar in the fridge (along with red and yellow curry pastes) and you can whip up an authentic-tasting Thai curry in mere minutes. Trim the brown tips from the fiddleheads. Bring a large pot of salted water to a rolling boil. Add the fiddleheads, bring back to a low boil, reducing the heat slightly, if necessary. Cook until the fiddleheads are just barely tender, about 2 minutes. Drain the fiddleheads quickly and plunge them immediately into a cold water bath to halt the cooking process. Drain again and set aside momentarily. Open a can of coconut milk and spoon 3 – 4 tablespoons of the thick, solid “cream” from the top into a large pot. Heat the coconut cream over medium high heat until it melts and begins to bubble. Add the shallot, ginger, garlic and curry paste and cook, stirring occasionally, until the vegetables become tender, about 5 minutes. Add the chicken and carrots and stir again. Mix in the remaining coconut milk and cream, reduce heat to medium-low and cover. Simmer for 15 minutes, or until the carrots are tender-crisp. Add the fiddleheads and cook for another 5 minutes, or until heated through. Stir in the lime juice, sugar, fish sauce and salt. Simmer for a moment, then taste and adjust the fish sauce, sugar and lime juice to achieve a good balance of salty, sweet and sour. Ladle into serving bowls and sprinkle with fresh basil leaves and sliced chives. Serve with fragrant steamed jasmine rice.